Table 22.1 summarizes the results for androgen receptor binding and agonistic activity. The binding activity shows that introduction of a 7a-methyl or ethyl group to nandrolone increases the relative binding affinity (RBA) while a 7a-vinyl or ethynyl did not increase the RBA. Org X has a RBA that is 3-fold higher than nandrolone and 9-fold higher than testosterone. The relative agonistic activity (RAA), however, of all the 7a- derivatives of nandrolone is higher than would be expected from the RBA. The 7a-substituents increase the agonistic activity with the highest increase for the methyl substituent. Org X has an agonistic androgen activity which is 4-fold higher than that of nandrolone and 14-fold higher than that of testosterone. 5a-dihydrotestosterone was used as reference compound and set at 100%. Data are mean ± SEM, number of experiments between brackets. Fig. 22.6 Metabolic stability of nandrolone derivatives in cryopreserved human male hepatocytes. Testosterone and 17a-methyltestosterone were used as metabolically unstable and stable reference compounds, respectively. Fig. 22.7 Susceptibility of androgens for human recombinant aromatase as determined with bioassays for androgen receptor (panel A) and estrogen receptor(a) activation (panel B) (see also Table 22.2). comparable to or much better than that of 17a-methyltestosterone, respectively. Nandrolone, MENT and 7a-vinyl nandrolone have a metabolic stability comparable to the metabolically unstable testosterone. 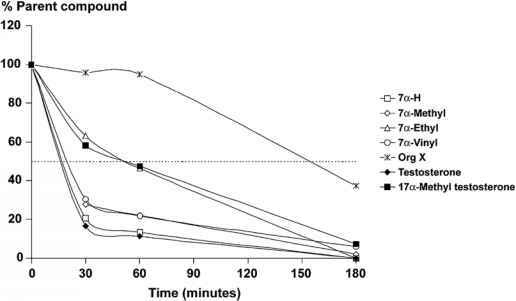 Rats were treated once daily for 4 days with different doses and the minimal active dose (MAD) (resulting in 65% ± 10% suppression of LH) is indicated. Data are means of different independent experiments (indicated between brackets). compounds are rapidly converted by human aromatase as shown by a sharp decrease in androgenic activity and a concomitant rapid increase in estrogenic activity. All 7a-substituted nandrolone derivatives can be converted by human aromatase to their phenolic A-ring derivatives (Table 22.2). 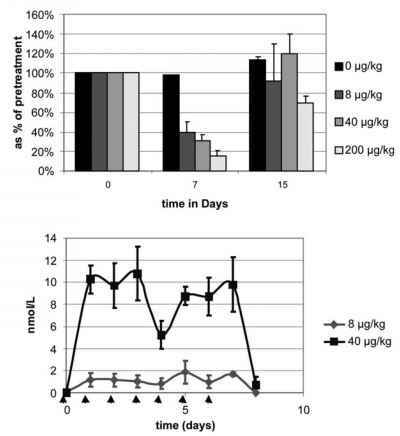 The relative in vivo potency was determined after 4 days of treatment of castrated rats by assessing the suppressing effect on serum LH (Table 22.3). Org X was the most active compound in this test. On average only a daily dose of 0.32 mg/kg was needed for 65% suppression of serum LH. This means that Org X is about 100 times more potent than testosterone undecanoate, the current oral standard for human use. The nandrolone derivatives were more active than testosterone (3.5-12.5 and 70 mg/kg, respectively). 17a-methyltestosterone is relatively inactive in suppressing serum LH in the rat; approximately 31 mg/kg was required. The most promising compounds were evaluated in the rat osteoporosis test, in which androgens were given orally for six weeks to male castrated rats. Six weeks following castration a consistent and statistically significant loss in trabecular BMD was observed in the distal femur (Fig. 22.8). With the reference androgen, testosterone undecanoate, daily oral treatment with 80 mg/kg per day is required to maintain trabecular BMD at intact levels (A). With this dose LH (D) was completely suppressed and FSH (E) levels were suppressed to intact levels. At 80 mg/kg per day the ventral prostate weight (B) reached intact levels (90% from the placebo intact group). At a dose of 20 mg/kg anabolic effects were already found, the musculus levator ani (MLA) was maintained at intact levels with this dose (C). With OrgX, with as low a daily dose of 2 mg/kg, trabecular BMD was maintained at intact levels and LH and FSH were suppressed towards intact levels. 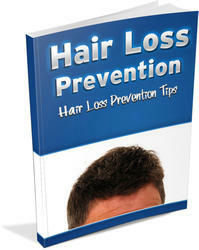 At this dose a clear prostate-sparing effect was observed, i.e. the ventral prostate weight was only 40% of the placebo-treated intact rats. Anabolic activity, however, was already complete at the lowest tested daily dose of 0.25 mg/kg. In conclusion, OrgX is around 40 times more potent than the reference androgen testosterone undecanoate in the prevention ofcastration-induced BMD loss and at the same time has a prostate-sparing effect. For the evaluation of efficacy of the most promising orally active androgens the non-seasonal, Old World primate model Macaca arctoides was used. The pharmacological efficacy parameter which is most easily tested is suppression of serum testosterone. Three pre-treatment blood samples were collected from each monkey and the average pre-treatment testosterone level was set at 100% for each individual monkey. The normal range of total testosterone in these animals is 15-40 nmol/l. 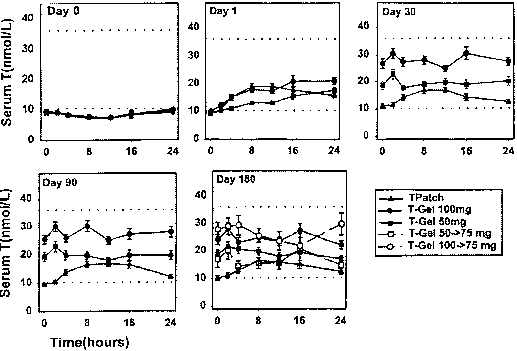 Once-daily oral treatment of intact male monkeys Macaca arctoides for seven days with different doses of Org X resulted in a dose-dependent suppression of serum testosterone at day 7 (24 hours after the last oral treatment (Fig. 22.9)). A daily dose of 8 |xg/kg yielded 60% suppression of endogenous testosterone. Nine days after the last dose, plasma testosterone levels had returned to the normal range (8 to 40 |xg/kg/day) at 200 |xg/kg/day probably more time is required for recovery. Org X is 80 times more potent than 17a-methyltestosterone, since ~660 |xg/kg is required for similar suppression of plasma testosterone in this model (Ubink etal. 2003). Fig. 22.8 Effect of once-daily (for 6 weeks) oral treatment of castrated male rats with several doses of testosterone undecanoate (TU, left panel) and Org X (right panel) on trabecular bone mineral density (BMD) (A), ventral prostate (VP) weight (B), musculus levator ani (MLA) weight (C), serum LH (D) and serum FSH (E). Placebo-treated intact and placebo-treated castrated rats are included (Placebo Int and Placebo ORX, respectively). Data represent mean ± SEM (N = 5), * significantly different from Orx placebo (p < 0.05). Fig. 22.9 Effect of once-daily (for 7 days) oral treatment of intact Macaca arctoides with indicated doses of Org X on plasma testosterone on day 7 (24 hours after last application) and day 15 (day 9 of recovery) (upper panel) and trough (nadir) plasma levels of Org X (lower panel). Data represents mean ± SEM (N = 3). Arrows indicate oral application. Plasma levels of Org X were determined throughout the experiment. Trough levels (just before a new oral application, 24 hours after application of the compound) were in the range 1.8 -10 nmol/l at doses of 8 and 40 |xg/kg/day, respectively (Fig. 22.9). Since the relative agonistic activity of Org X is 14-fold higher than that of testosterone (see 22.4.1), at a dose of 8 |xg/kg 25 nmol/l (1.8*14) testosterone equivalents are present in the circulation. In addition, 16.2 nmol/l testosterone is still present in this trough sample at day 7 (40% of an average pre-treatment level of 38.1 nmol/l); therefore a total of 41 nmol/l testosterone equivalents is present. This total amount of testosterone equivalents is just in the normal range (15-40 nmol/l) of testosterone. The effect of long-term application of Org X is currently under investigation. TV2 (in hours), normalized Area Under Curve (to 1 mg/kg) extrapolated to infinity (nAUCinf, h*nmol/l) and normalized maximal concentration (nCmax, nmol/l) are presented. Since at the start of the project the preferred species for the evaluation of single-dose pharmacokinetics (SD-PK) was not known, most of the compounds were evaluated in rat, rabbit, and monkey after oral administration (Table 22.4). In the rat t1/2 was rather similar for the androgens tested and there was no direct relationship with the observed minimal active dose (MAD) for LH suppression after 4 days treatment of male castrated rats (section 22.4.4. and Table 22.3). In the rabbit clear differences between compounds were observed; 17a-methyltestosterone resulted in longer t1/2 and higher nAUCinf than testosterone. With Org X a longer t1/2 was found compared to the 7a-alkylated nandrolone derivatives. In the female monkey most pronounced differences between the different compounds were observed. 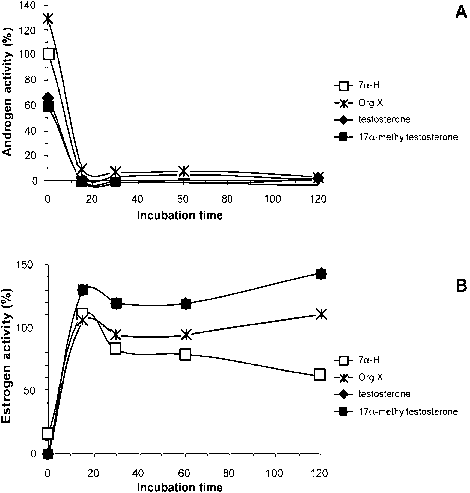 17a-methyltestosterone resulted in a longer t1/2 than testosterone (3.9 and 1.33 hours, respectively). With the 7a-methyl/ethyl/vinyl nan-drolones relatively low exposures (nAUCinf) compared to testosterone were found. The optimal kinetic profile was observed with Org X, a t1/2 and nAUCinf of 16.9 hours and 882 nmoPhours were found, respectively.